Background: Tiotropium + olodaterol has demonstrated improvements beyond lung function benefits in a large Phase III clinical program as a once-daily maintenance treatment for COPD and may be a potential option for the initiation of maintenance treatment in COPD. Despite guideline recommendations that combined long-acting β2-agonists and inhaled corticosteroids should only be used in individuals at high risk of exacerbation, there is substantial use in individuals at lower risk. This raises the question of the comparative effectiveness of this combination as maintenance treatment in this group compared to other combination regimens. Objective: The study aimed to assess the effect on lung function of once-daily tiotropium + olodaterol versus twice-daily salmeterol + fluticasone propionate in all participants with Global initiative for chronic Obstructive Lung Disease 2 or 3 (moderate to severe) COPD. 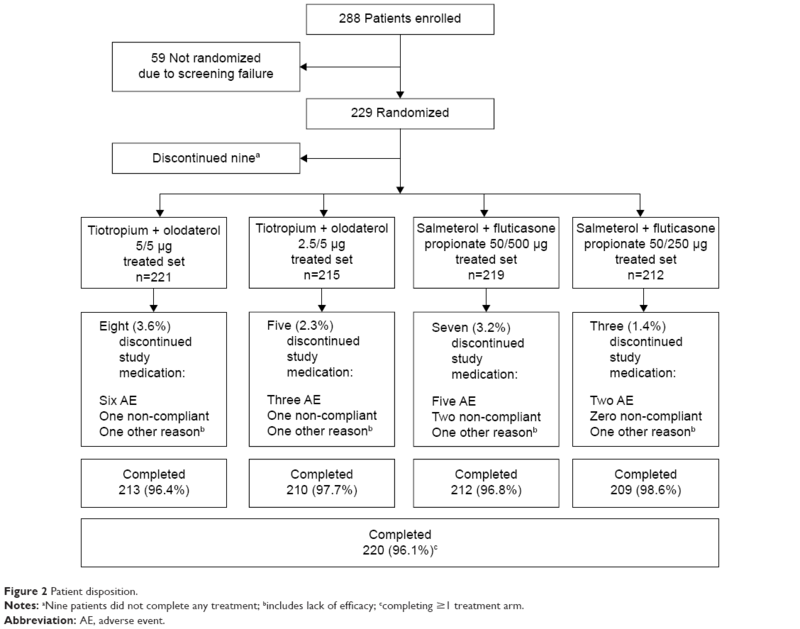 Methods: This was a randomized, double-blind, double-dummy, four-treatment, complete crossover study in which participants received once-daily tiotropium + olodaterol (5/5 µg and 2.5/5 µg) via Respimat® and twice-daily salmeterol + fluticasone propionate (50/500 µg and 50/250 µg) via Accuhaler® for 6 weeks. The primary end point was change in forced expiratory volume in 1 second (FEV1) area under the curve from 0 hour to 12 hours (AUC0–12) relative to the baseline after 6 weeks. Results: Tiotropium + olodaterol 5/5 µg and 2.5/5 µg demonstrated statistically significant improvements in FEV1 AUC0–12 compared to salmeterol + fluticasone propionate (improvements from baseline were 317 mL and 295 mL with tiotropium + olodaterol 5/5 µg and 2.5/5 µg, and 188 mL and 192 mL with salmeterol + fluticasone propionate 50/500 µg and 50/250 µg, respectively). Tiotropium + olodaterol was superior to salmeterol + fluticasone propionate in lung function secondary end points, including FEV1 area under the curve from 0 hour to 24 hours (AUC0–24). Conclusion: Once-daily tiotropium + olodaterol in participants with moderate-to-severe COPD provided superior lung function improvements to twice-daily salmeterol + fluticasone propionate. Dual bronchodilation can be considered to optimize lung function in individuals requiring maintenance treatment for COPD. ENERGITO® was a Phase IIIb, multicenter, multinational, randomized, double-blind, double-dummy, active-controlled, four-treatment, complete crossover study to compare the effect, on the lung function profile, of orally inhaled once-daily tiotropium + olodaterol (5/5 μg and 2.5/5 μg) via Respimat® compared to twice-daily salmeterol + fluticasone propionate (50/500 μg and 50/250 μg) via Accuhaler® after 6 weeks of treatment in participants with COPD. The trial was registered with ClinicalTrials.gov under official identifier NCT01969721. The primary end point was the response (change from baseline) in terms of FEV1 AUC from 0 hour to 12 hours (AUC0–12) after 6 weeks of treatment. The key secondary end point was response in terms of FEV1 AUC from 0 hour to 24 hours (AUC0–24). Other secondary end points were response in terms of FEV1 AUC from 12 hours to 24 hours (AUC12–24), peak FEV1 from 0 hour to 3 hours (peak0–3 FEV1) response, and trough FEV1 response. The primary safety end point was the incidence of AEs. Further end points were trough forced vital capacity (FVC) response; peak0–3 FVC response; FVC AUC0–24, FVC AUC0–12, and FVC AUC12–24 responses; and FEV1 and FVC measured at all time points after 6 weeks of treatment. Eligible participants entered a 4-week screening period during which prescription corticosteroids (inhaled or oral), β-adrenergics (inhaled short- or long-acting, oral or patch, except for β-blockers), and long-acting anticholinergics were discontinued. Participants were then randomized into the crossover part of the study and received each of the four treatments – tiotropium + olodaterol 5/5 μg and 2.5/5 μg and salmeterol + fluticasone propionate 50/500 μg and 50/250 μg – for a period of 6 weeks in a randomized sequence, with each treatment separated by a 21-day washout (Figure 1). Notes: Treatment periods are 6 weeks and washout periods are 3 weeks. A–D refer to treatment groups. Abbreviations: R, randomization; S, screening. Participants entered a 21-day follow-up period after study completion or discontinuation, during which they were permitted to resume medications prescribed prior to the study. Open-label salbutamol was provided for rescue medication use, which was recorded by the participant. A short-acting anticholinergic (ipratropium bromide) was provided for use during the screening and washout periods. Each morning, participants self-administered two puffs of the Respimat® (tiotropium + olodaterol 5/5 μg or 2.5/5 μg or placebo) followed by one puff of the Accuhaler® (salmeterol + fluticasone propionate 50/500 μg or 50/250 μg or placebo). Each evening (12 hours after the morning dose), participants inhaled one puff of the Accuhaler® only. Self-administration of medication was performed under supervision during clinic visits and the time of administration was recorded for accurate timing of postdose PFT. The timing of medication dosing was established at the start of each treatment period, and subsequent doses were administered within 30 minutes of the first dose time (ie, at 24 hours ±30 minutes). At the screening visit, in addition to physical examination and laboratory testing, participants underwent reversibility testing using 400 μg salbutamol and received training in use of the devices. At the start of the treatment periods, predose PFT was performed at 1 hour and at 10 minutes prior to inhalation of trial medication for the first treatment period, then at 30 minutes before dosing at the start of subsequent treatment periods. Postdose PFT at the start of all treatment periods was performed at 30 minutes, 1 hour, 2 hours, and 3 hours postdose. At the end of each 6-week dosing period, PFT was performed 30 minutes prior to inhalation of trial medication and up to 24 hours after dosing (30 minutes, 1 hour, 2 hours, 3 hours, 4 hours, 6 hours, 8 hours, 10 hours, 11 hours 50 minutes, 12 hours 30 minutes, 13 hours, 14 hours, 22 hours, 23 hours, and 23 hours 50 minutes postdose). PFT up to 14 hours postdose was included to capture the peak associated with the evening dose of salmeterol + fluticasone propionate. PFT was performed using MasterScope® CT spirometers (ERT, Hoechberg, Germany), which complied with, and were calibrated daily in accordance with, the criteria of the American Thoracic Society and European Respiratory Society.23 AEs and concomitant therapies were recorded from screening through to follow-up. Efficacy analyses were performed for all participants who received at least one dose of trial medication and had both baseline and postbaseline measurements for the primary end point, defined as the full analysis set. The per-protocol analysis set was defined as all participants without any important protocol deviations related to efficacy in any treatment period. If the number of participants in the per-protocol analysis set was <90% of those in the full analysis set, the primary efficacy analyses were to be performed on the per-protocol analysis set, as supportive analyses. All treated participants were included in the safety analyses. For the primary end point of FEV1 AUC0–12 response and key secondary end point of FEV1 AUC0–24 response, response is defined as change from patient baseline. Patient baseline values were obtained by calculating the mean of the period baseline values taken for each patient on the first day of each treatment period prior to administration of the morning dose. For the primary and secondary end points, hypotheses were tested in hierarchical order, each at the 5% level of significance (two-sided) to protect the overall probability of type I error at 0.05 (two-sided). For the primary and secondary end points, the changes from baseline (start of each treatment period) at 6 weeks were analyzed using a restricted maximum-likelihood-based mixed-effects repeated-measures model, including treatment and period as fixed effects, patient as random effect, and period baseline and patient baseline as covariates. Compound symmetry was used as a covariate structure for within-patient variation. The SAS procedure MIXED was used for the restricted maximum-likelihood estimation, and Kenward–Roger approximation was used for denominator degrees of freedom.24 Adjusted mean values as well as treatment comparisons are presented, together with 95% confidence intervals. Overall, 288 participants were enrolled in the study and 229 were randomized to receive treatment (Figure 2); 59 participants were not randomized due to screening failure. Discontinuation from study medication was low (nine participants did not complete any treatment arm); primary reasons for discontinuation were AEs and noncompliance (Figure 2). Notes: aNine patients did not complete any treatment; bincludes lack of efficacy; ccompleting ≥1 treatment arm. In the treated population, the majority of participants were male (64.6%) and white (99.6%), and almost half of participants were smokers at the time of the study (44.5%) (Table 1). Most participants had GOLD 2 lung function impairment (72.1%) and the remainder had GOLD 3 (27.9%). Participants were highly treated prior to the study; the most frequently recorded baseline pulmonary medications were LAMA (53.7%), short-acting β-agonist (53.3%), and LABA + ICS (38.0%) (Table 1). Abbreviations: FEV1, forced expiratory volume in 1 second; GOLD, Global initiative for chronic Obstructive Lung Disease; ICS, inhaled corticosteroid; LABA, long-acting β2-agonist; LAMA, long-acting muscarinic antagonist; SABA, short-acting β-agonist; SAMA, short-acting muscarinic antagonist; SD, standard deviation. FEV1 AUC0–12 (primary end point), FEV1 AUC0–24, and FEV1 AUC12–24 after 6 weeks of treatment were increased from baseline by >120 mL in all treatment arms, with greater increases at both dose levels of once-daily tiotropium + olodaterol compared to twice-daily salmeterol + fluticasone propionate. Responses appeared to be similar for the two dose levels of tiotropium + olodaterol and salmeterol + fluticasone propionate (Table 2). Treatment comparisons for the primary end point revealed statistically significant improvements in FEV1 AUC0–12 with either dose of tiotropium + olodaterol compared to either dose of salmeterol + fluticasone propionate, ranging from +103 mL to +129 mL (P<0.0001 for all comparisons). Notes: The adjusted mean (SE) was obtained from fitting a mixed-effects repeated-measures model including the following: fixed effects of treatment and period; period baseline and patient baseline as covariates; patient as a random effect; compound symmetry covariance structure for within-patient variation; and Kenward–Roger approximation of denominator degrees of freedom. Abbreviations: AUC, area under the curve; AUC0–12, AUC from 0 hour to 12 hours; AUC0–24, AUC from 0 hour to 24 hours; AUC12–24, AUC from 12 hours to 24 hours; FEV1, forced expiratory volume in 1 second; SE, standard error. Tiotropium + olodaterol showed improved FEV1 values over the full 24-hour dosing interval compared to salmeterol + fluticasone propionate after 6 weeks of treatment (Figure 3). Accordingly, analysis of the key secondary end point of FEV1 AUC0–24 response showed significantly greater improvements with either dose of tiotropium + olodaterol versus either dose of salmeterol + fluticasone propionate, ranging from +65 mL to +86 mL (P<0.0001 for all comparisons) (Table 3). 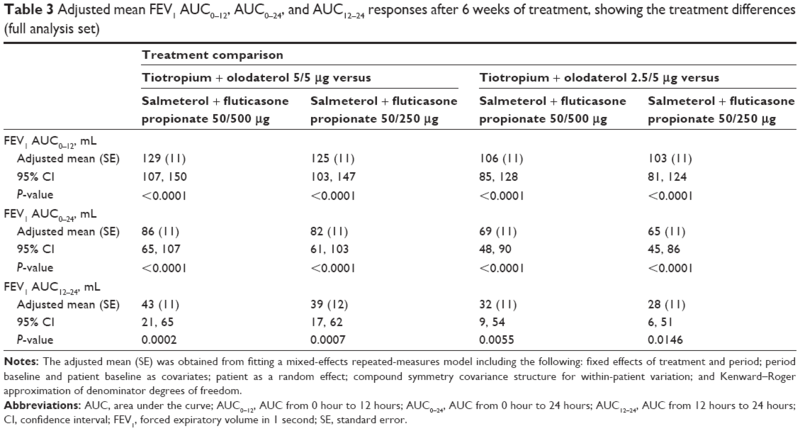 Improvements in FEV1 AUC12–24 response after 6 weeks of treatment were also significantly greater with tiotropium + olodaterol compared to salmeterol + fluticasone propionate (P<0.05 for all comparisons) (Table 3). There was a trend for greater improvement in FEV1 AUC parameters with tiotropium + olodaterol 5/5 μg compared to either dose of salmeterol + fluticasone than with tiotropium + olodaterol 2.5/5 μg compared to salmeterol + fluticasone (Table 3). Figure 3 Adjusted mean 24-hour FEV1 profile after 6 weeks of treatment (full analysis set). Abbreviations: bid, twice daily; F, fluticasone propionate; FEV1, forced expiratory volume in 1 second; O, olodaterol; qd, once daily; S, salmeterol; T, tiotropium. Abbreviations: AUC, area under the curve; AUC0–12, AUC from 0 hour to 12 hours; AUC0–24, AUC from 0 hour to 24 hours; AUC12–24, AUC from 12 hours to 24 hours; CI, confidence interval; FEV1, forced expiratory volume in 1 second; SE, standard error. The peak0–3 FEV1 responses at Day 1 and Day 43 and trough FEV1 responses after 6 weeks of treatment for tiotropium + olodaterol and salmeterol + fluticasone propionate are shown in Table 4. At the end of the 6-week treatment period (Day 43), tiotropium + olodaterol improved peak0–3 FEV1 response by +111 mL to +147 mL compared to salmeterol + fluticasone propionate (P<0.0001 for all comparisons) (Table 5). Notably, tiotropium + olodaterol also gave greater improvements in trough FEV1 after 6 weeks of treatment compared to both doses of salmeterol + fluticasone propionate, with improvements of +58 mL and +54 mL with tiotropium + olodaterol 5/5 μg and 2.5/5 μg, respectively, versus salmeterol + fluticasone propionate 50/500 μg (P<0.001 for all comparisons) (Table 5). Abbreviations: FEV1, forced expiratory volume in 1 second; peak0–3 FEV1, peak forced expiratory volume in 1 second from 0 hour to 3 hours; SE, standard error. Abbreviations: CI, confidence interval; FEV1, forced expiratory volume in 1 second; peak0–3 FEV1, peak forced expiratory volume in 1 second from 0 hour to 3 hours; SE, standard error. Changes in FVC after 6 weeks of treatment were significantly greater with tiotropium + olodaterol compared to salmeterol + fluticasone propionate, measured as FVC AUC0–12, FVC AUC0–24, FVC AUC12–24, and FVC AUC0–3, trough FVC, and peak0–3 FVC responses (P<0.0001 for all comparisons of tiotropium + olodaterol versus salmeterol + fluticasone propionate). The improvement in FVC with tiotropium + olodaterol compared to salmeterol + fluticasone propionate was maintained over the full 24-hour dosing interval (Figure 4 and Tables S2 and S3). Figure 4 Adjusted mean 24-hour FVC profile after 6 weeks of treatment (full analysis set). Abbreviations: bid, twice daily; F, fluticasone propionate; FVC, forced vital capacity; O, olodaterol; qd, once daily; S, salmeterol; T, tiotropium. Overall, the frequency of AEs was similar between all treatment groups, with 29.7%–37.0% of participants reporting at least one AE while on treatment. 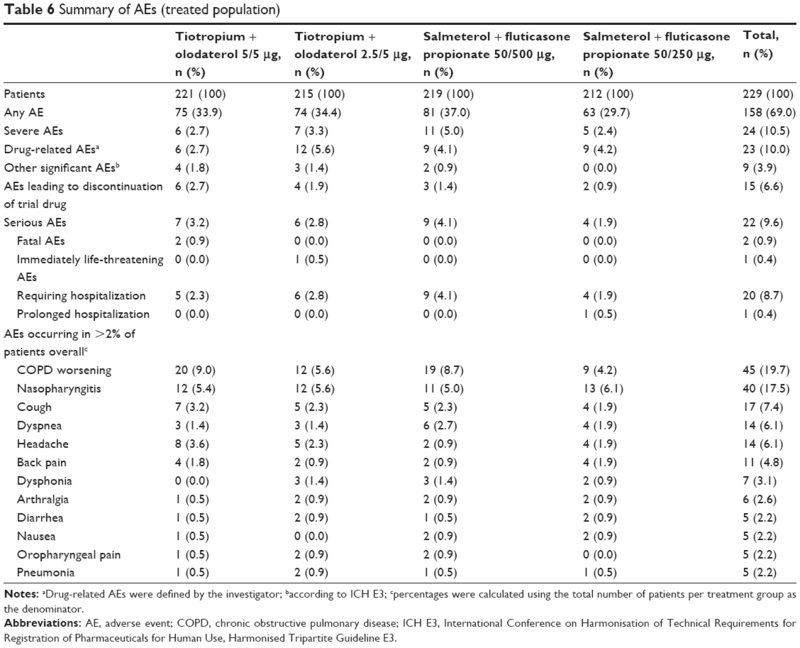 The most common AEs were COPD worsening, nasopharyngitis, and cough (Table 6). Severe AEs were recorded in ≤5% of participants and AEs leading to discontinuation occurred in <3% of participants in each treatment group. Serious AEs occurred in ≤4.1% of participants. There were two serious AEs leading to death in the tiotropium + olodaterol 5/5 μg group, one of which was a cerebral hemorrhage in a predisposed patient and the other occurred 19 days after the last dose of study treatment, with unknown cause (Table 6). Notes: aDrug-related AEs were defined by the investigator; baccording to ICH E3; cpercentages were calculated using the total number of patients per treatment group as the denominator. Abbreviations: AE, adverse event; COPD, chronic obstructive pulmonary disease; ICH E3, International Conference on Harmonisation of Technical Requirements for Registration of Pharmaceuticals for Human Use, Harmonised Tripartite Guideline E3. 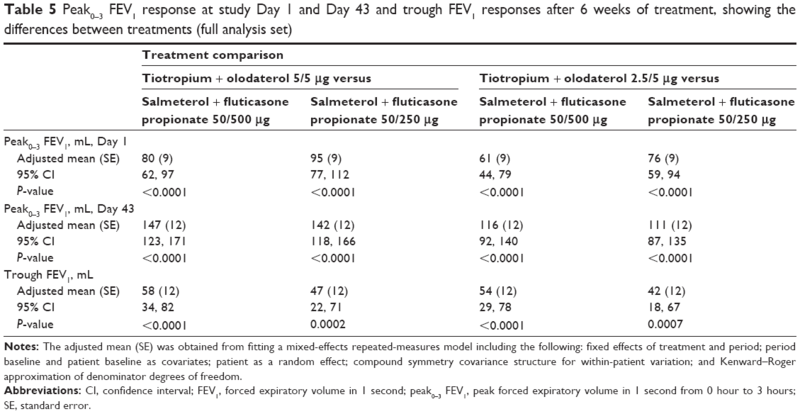 In this study, once-daily tiotropium + olodaterol improved lung function to a greater extent than twice-daily salmeterol + fluticasone propionate, demonstrating significant improvements in the primary end point of FEV1 AUC0–12 and all other measures of lung function. Importantly, superiority in lung function improvement with once-daily tiotropium + olodaterol compared to twice-daily salmeterol + fluticasone propionate was demonstrated over the full 24-hour dosing period. These results add to the 24-hour lung function profile of tiotropium + olodaterol from the VIVACITO® study. In addition, ENERGITO® included PFT measurements between 12 hours and 14 hours to account for the evening dose of salmeterol + fluticasone propionate; this testing schedule provided more rigorous testing over the full dosing interval compared to previous tiotropium + olodaterol studies. Optimization of lung function is an important treatment goal through the course of COPD, and there is a strong rationale to provide these benefits from the point at which individuals are identified as needing initiation of maintenance treatment. Although measures of symptomology and health-related quality of life are required, improvements in lung function measures have been shown to predict improvements in patient-reported outcomes, as well as risk of exacerbation.26 While this study did not include health status or symptomatic end points, four large studies have demonstrated that improvements in lung function with tiotropium + olodaterol are accompanied by clinically meaningful improvements in St George’s Respiratory Questionnaire score.9,27 In addition, an exploratory analysis from the TONADO® studies suggested a trend toward improvement in exacerbations;9 a large ongoing 52-week study will define the impact of tiotropium + olodaterol on exacerbation risk (DYNAGITO®; NCT02296138; 1237.19). The lung function results from the current study are also broadly in line with another study suggesting that LABA + ICS may not be the most effective treatment for improving lung function in individuals with moderate-to-severe COPD.1 In that study, a greater lung function response with indacaterol + glycopyrronium versus salmeterol + fluticasone was accompanied by a significant treatment-corrected difference in Transition Dyspnea Index focal score, but no difference in St George’s Respiratory Questionnaire score. 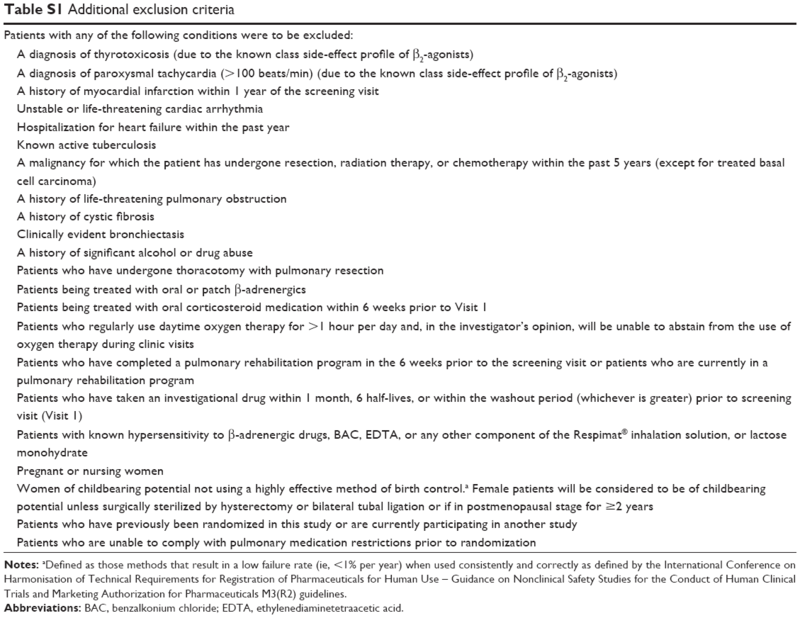 One potential limitation of the study is that it cannot be interpreted directly in the context of the current GOLD recommendations for treatment options, wherein individuals are grouped according to airflow limitation, exacerbation risk, symptoms, and breathlessness (GOLD patient groups A–D).2 Inclusion in the ENERGITO® study was based on the spirometric assessment of severity of airflow limitation used in an earlier version of the GOLD strategy report;22 participants with GOLD 2 and 3 (moderate and severe) COPD were screened and patient symptoms or exacerbation risk were not assessed as enrollment criteria. Regardless of this, the findings suggest that tiotropium + olodaterol provides lung function benefits in a representative population with moderate-to-severe COPD and that response to treatment is not affected by the prior use or type of maintenance treatment. In this study, there was no apparent difference in lung function response between the two doses of salmeterol + fluticasone propionate tested (50/250 μg and 50/500 μg). This observation was similar to that seen in the recent WISDOM study, which assessed the effect of stepwise withdrawal of ICS from a regimen containing tiotropium, salmeterol, and fluticasone propionate. In the WISDOM study, there was no change in lung function when the twice-daily dose of fluticasone propionate was reduced from 500 μg to 250 μg, although participants were only observed on the 250 μg dose for a period of 6 weeks. Complete cessation of fluticasone propionate resulted in a modest decrease in lung function.28 These observations raise the question of whether only a low dose of ICS is required to achieve potential lung function improvement with these agents. For individuals with moderate-to-severe COPD who require maintenance treatment with the goal of improving lung function, with associated symptomatic and health-status benefits, tiotropium + olodaterol should be considered as another treatment option that offers better lung function optimization than LABA + ICS. While tiotropium + olodaterol has demonstrated clinically significant improvements in symptoms and quality of life versus placebo,27 further studies are warranted to confirm whether the additional improvements of tiotropium + olodaterol relative to LABA + ICS demonstrated in this study translate into additional clinically relevant benefits for individuals. This work was supported by Boehringer Ingelheim Pharma GmbH & Co. KG. The authors received no compensation related to the development of the manuscript. This work was supported by Boehringer Ingelheim Pharma GmbH & Co. KG. Medical writing assistance was provided by Tanja Torbica and Claire Scofield, on behalf of Complete HealthVizion, and was contracted and compensated by Boehringer Ingelheim Pharma GmbH & Co. KG. The authors meet criteria for authorship as recommended by the International Committee of Medical Journal Editors. They take full responsibility for the scope, direction, content of, and editorial decisions relating to, the manuscript, and were involved at all stages of development. All authors contributed toward data analysis, drafting and critically revising the paper, and they have approved the submitted manuscript and agree to be accountable for all aspects of the work. The institution where KMB is employed has received compensation for organizing or participating in advisory boards for Almirall Hermal, Cytos, Chiesi, Boehringer Ingelheim, AstraZeneca, Mundipharma, Novartis, and Revotar Biopharmaceuticals, and for participation in scientific meetings or courses supported by various pharmaceutical companies (Almirall Hermal, AstraZeneca, Boehringer Ingelheim, Novartis, Pfizer, and Takeda) in the past 3 years. KMB’s institution has also received consulting fees from Ablynx, Apellis Pharmaceuticals, Chiesi, and Cytos. The institution has received compensation for the design, performance or participation in single or multi-center clinical trials in the past 3 years from several companies including Almirall, Boehringer Ingelheim, Cytos, GSK, Mundipharma, Novartis, Pfizer, Revotar Biopharmaceuticals, Sterna AG, and TEVA. ED reports consultancy fees from Actelion, Boehringer, AstraZeneca, and Cipla, advisory board fees for Chiesi, AstraZeneca, and CSL Behring, and speaker fees for GlaxoSmithKline and Boehringer. LG and AH are employees of Boehringer Ingelheim. JES, DZ, and LB report no conflicts of interest in this work. Vogelmeier CF, Bateman ED, Pallante J, et al. Efficacy and safety of once-daily QVA149 compared with twice-daily salmeterol-fluticasone in patients with chronic obstructive pulmonary disease (ILLUMINATE): a randomised, double-blind, parallel group study. Lancet Respir Med. 2013;1(1):51–60. Global Initiative for Chronic Obstructive Lung Disease. Global Strategy for the Diagnosis, Management, and Prevention of Chronic Obstructive Pulmonary Disease; [updated February 18, 2015]. Available from: http://www.goldcopd.org/uploads/users/files/GOLD_Report_2015_Feb18.pdf. Accessed September 30, 2015. Tashkin DP, Celli B, Senn S, et al. A 4-year trial of tiotropium in chronic obstructive pulmonary disease. N Engl J Med. 2008;359(15): 1543–1554. Bateman ED, Tashkin D, Siafakas N, et al. A one-year trial of tiotropium Respimat® plus usual therapy in COPD patients. Respir Med. 2010;104(10):1460–1472. Yohannes AM, Willgoss TG, Vestbo J. Tiotropium for treatment of stable COPD: a meta-analysis of clinically relevant outcomes. Respir Care. 2011;56(4):477–487. Vogelmeier C, Hederer B, Glaab T, et al. Tiotropium versus salmeterol for the prevention of exacerbations of COPD. N Engl J Med. 2011;364(12):1093–1103. O’Donnell DE, Flüge T, Gerken F, et al. Effects of tiotropium on lung hyperinflation, dyspnoea and exercise tolerance in COPD. Eur Respir J. 2004;23(6):832–840. Wise RA, Anzueto A, Cotton D, et al. Tiotropium Respimat inhaler and the risk of death in COPD. N Engl J Med. 2013;369(16): 1491–1501. Buhl R, Maltais F, Abrahams R, et al. Tiotropium and olodaterol fixed-dose combination versus mono-components in COPD (GOLD 2–4). Eur Respir J. 2015;45(4):969–979. Beeh K-M, Westerman J, Kirsten A-M, et al. The 24-h lung-function profile of once-daily tiotropium and olodaterol fixed-dose combination in chronic obstructive pulmonary disease. Pulm Pharmacol Ther. 2015;32:53–59. Global Initiative for Asthma. Diagnosis of Diseases of Chronic Airflow Limitation: Asthma COPD and Asthma – COPD Overlap Syndrome (ACOS); [updated 2014]. Available from: http://www.goldcopd.org/uploads/users/files/AsthmaCOPDOverlap.pdf. Accessed July 30, 2015. Roche N, Pribil C, Van Ganse E, et al. Real-life use of fluticasone propionate/salmeterol in patients with chronic obstructive pulmonary disease: a French observational study. BMC Pulm Med. 2014;14:56. Drivenes E, Østrem A, Melbye H. Predictors of ICS/LABA prescribing in COPD patients: a study from general practice. BMC Fam Pract. 2014;15:42. Price D, West D, Brusselle G, et al. Management of COPD in the UK primary-care setting: an analysis of real-life prescribing patterns. Int J Chron Obstruct Pulmon Dis. 2014;9:889–905. Watz H, Ferguson GT, Grönke L, Vob F, Abrahams R, Buhl R. Inhaled corticosteroid plus long-acting β2-agonist therapy is overused in the treatment of patients with chronic obstructive pulmonary disease: post hoc analyses of two 1-year studies [abstract]. Am J Respir Crit Care Med. 2015;191(Meeting Abstracts):A5784. Tricco AC, Strifler L, Veroniki AA, et al. Comparative safety and effectiveness of long-acting inhaled agents for treating chronic obstructive pulmonary disease: a systematic review and network meta-analysis. BMJ Open. 2015;5(10):e009183. Bouyssou T, Casarosa P, Naline E, et al. Pharmacological characterization of olodaterol, a novel inhaled β2-adrenoceptor agonist exerting a 24-hour-long duration of action in preclinical models. J Pharmacol Exp Ther. 2010;334(1):53–62. Lange P, Aumann J-L, Derom E, et al. The 24-h FEV1 time profile of olodaterol QD delivered via Respimat® in COPD: results from two 6-week studies [abstract 4635]. Eur Respir J. 2013;42(suppl 57): 982s. Ferguson G, Feldman G, Hofbauer P, et al. Lung function efficacy of olodaterol QD delivered via Respimat® in COPD patients: results from two 48-week studies [abstract 187]. Eur Respir J. 2013;42(suppl 57):5s. Beeh K-M, Derom E, Echave-Sustaeta J, et al. ENERGITO: efficacy and safety of once-daily combined tiotropium + olodaterol versus twice-daily combined fluticasone propionate + salmeterol. Abstract presented at: The European Respiratory Society International Conference; September 26–30, 2015; Amsterdam. Quanjer PH, Tammeling GJ, Cotes JE, Pedersen OF, Peslin R, Yernault JC. Lung volumes and forced ventilatory flows. Eur Respir J. 1993;6(suppl 16):5–40. Global Initiative for Chronic Obstructive Lung Disease. Global Strategy for the Diagnosis, Management, and Prevention of Chronic Obstructive Pulmonary Disease; 2010 [updated 2010]. Available from: http://www.goldcopd.org/uploads/users/files/GOLDReport_April112011.pdf. Accessed August 12, 2015. Miller MR, Hankinson J, Brusasco V, et al. Standardisation of spirometry. Eur Respir J. 2005;26(2):319–338. Kenward MG, Roger JH. The use of baseline covariates in crossover studies. Biostatistics. 2010;11(1):1–17. Pisi R, Aiello M, Zanini A, et al. Small airway dysfunction and flow and volume bronchodilator responsiveness in patients with chronic obstructive pulmonary disease. Int J Chron Obstruct Pulmon Dis. 2015;10:1191–1197. Jones PW, Donohue JF, Nedelman J, Pascoe S, Pinault G, Lassen C. Correlating changes in lung function with patient outcomes in chronic obstructive pulmonary disease: a pooled analysis. Respir Res. 2011;12:161. Singh D, Ferguson GT, Bolitschek J, et al. Tiotropium + olodaterol shows clinically meaningful improvements in quality of life. Respir Med. 2015;109(10):1312–1319. Magnussen H, Disse B, Rodriguez-Roisin R, et al. Withdrawal of inhaled glucocorticoids and exacerbations of COPD. N Engl J Med. 2014;371(14):1285–1294. Notes: aDefined as those methods that result in a low failure rate (ie, <1% per year) when used consistently and correctly as defined by the International Conference on Harmonisation of Technical Requirements for Registration of Pharmaceuticals for Human Use – Guidance on Nonclinical Safety Studies for the Conduct of Human Clinical Trials and Marketing Authorization for Pharmaceuticals M3(R2) guidelines. Abbreviations: BAC, benzalkonium chloride; EDTA, ethylenediaminetetraacetic acid. Notes: *P<0.0001. The adjusted mean (SE) was obtained from fitting a mixed-effects repeated-measures model including the following: fixed effects of treatment and period; period baseline and patient baseline as covariates; patient as a random effect; compound symmetry covariance structure for within-patient variation; and Kenward–Roger approximation of denominator degrees of freedom. Abbreviations: AUC0–12, area under the curve from 0 hour to 12 hours; AUC0–24, area under the curve from 0 hour to 24 hours; AUC12–24, area under the curve from 12 hours to 24 hours; CI, confidence interval; FVC, forced vital capacity; SE, standard error. Abbreviations: AUC0–3, area under the curve from 0 hour to 3 hours; CI, confidence interval; FVC, forced vital capacity; peak0–3 FVC, peak forced vital capacity from 0 hour to 3 hours; SE, standard error.